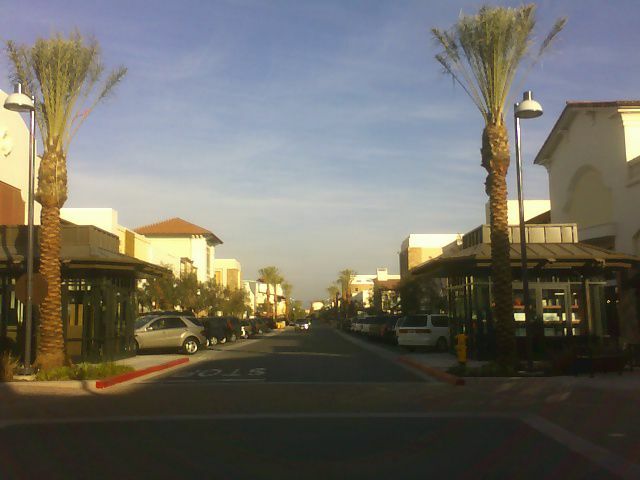 Otay Ranch Town Center opened in 2006 and is located in the Eastlake area of Chula Vista. It is a premier place to shop in San Diego, offering a vibrant open-air setting for people-watching and whiling away hours with friends, children, and pets. What makes this Otay Ranch mall different from the many others in San Diego County? Otay Ranch Town Center isn't your typical mall monolith, anchored by giant department stores. Instead, it's a "lifestyle center," with storefronts actually facing a "Main Street," a sort of mini downtown shopping district. Retailers such as the H&M, Best Buy, Coach, Anthropologie, Macy's, Ann Taylor, Apple, Hollister, and REI are among 150 retail shops that occupy the space. Dining includes a Cheesecake Factory and P. F. Chang's China Bistro. The outdoor environment is pedestrian friendly but with an urban street setting. Kids will keep busy at popper fountains and a Chalk Garden, there's even a 10,000 square foot Doggie Park, for those inclined to bring their pooches along while shopping. Otay Ranch Town Center has four uniquely themed areas highlighting distinct California flavors: "Garden Court" is located on the west side of the center and will feature a popular mix of traditional retailers; in "Center Court," shoppers can enjoy the heart of Otay Ranch Town Center with its fashionable retailers, food pavilion, party space, fountains, chalk garden and a fireplace; the "Entertainment Court," located on the east side, will include a book store, first-class restaurants, and a 12-screen AMC Theatre complex; and "Lifestyle Row," on the far west side of the center, will feature upscale lifestyle tenants. Otay Ranch Town Center is located at Eastlake Pkwy At Olympic Pkwy, Chula Vista, CA 91915. Otay Ranch Town Center also has a food court with fast food favorites such as Subway, Jersey Mike's Subs, Hot Dog on a Stick, and Panda Express. Plus, every Tuesday from 4 pm to 8 pm, there is a local farmers market held along Main Street in Otay Ranch Mall. From fashion to food to fun, you can find a myriad of ways to spend your time at Otay Ranch Town Center in Chula Vista.